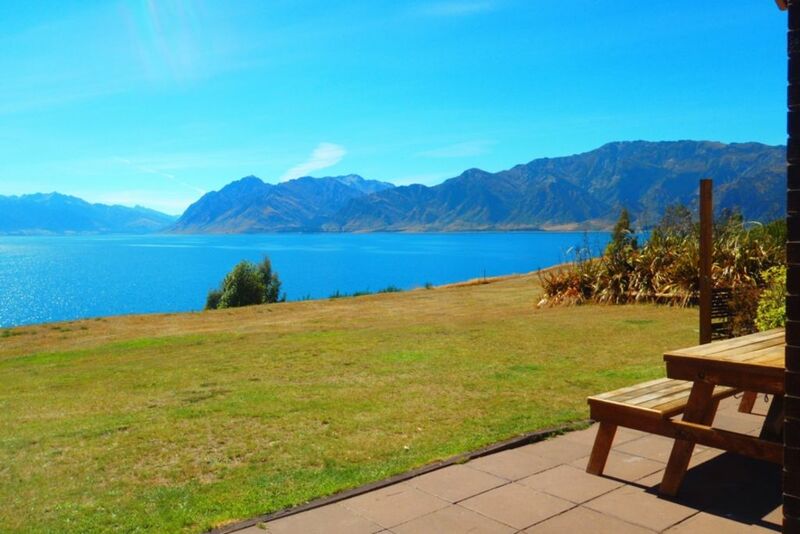 Absolute lakefront location with panoramic lake & mountain views over Lake Hawea. North facing property, very warm with a large wood burner & heat pump, double glazed windows & under floor/ceiling insulation. Open-planned modern house, with sweeping uninterrupted views over Lake Hawea, plenty of all day sun and privacy. Wanaka Vineyards & Wineries best in Central Otago short drive away. In lounge x1 Sofa bed and 1 stretcher available on request. Quality Linen supplied: Beds are already made for your arrival with quality linen, duvets and pillows. Electric blankets also provided. FREE to use Baby gear: Portacot's , Stroller / Mt Buggy, High chairs , please request when making your booking. Kitchen fully equipped with quality French Le Creuset cookware, Coffee, tea & sugar. -Dishwasher, kitchen appliances - blender, slow cooker. BBQ 4 burner, tables and chairs. Bellevue Lakefront House is only 2 min walk to the town centre - for groceries ,café & shop, also house is located opposite a restaurant & bar. Relax & enjoy the stunning views with all day sun on the outdoor verandah. Entertain friends with a BBQ, plenty of seating, umbrellas & a lake view. Abundance of birdlife in the landscaped garden with Fantails, Tui's, Bellbirds. Nearby bush walks, bike tracks and fishing spots. Rest, Relax, & enjoy Bellevue Lakeview House, a home away from home! Weekend Events : Wanaka Warbirds, EPIC Mt Bike Lake Hawea Race, Challenge Wanaka, Sovereign Tri Series Wanaka, Rippon Festival, Godzone adventure race. What an amazing location! So refreshing to the soul to look straight out to the lake and the mountains, while enjoying the warmth of the fire. The house was super warm and sunny and very well equipped. Raelene was so helpful in organising items for our little ones which we really appreciated. We wish we could've stayed for longer and would love to return! We will definitely be recommending this fantastic place to our friends and family. Sports Gear etc. Very close to the Pub & shop. Was very peaceful. Would recommend to others. Plenty of linen & kitchen had everything in it. The Home was warm and comfortable with all the amenities and the views spectacular. Shops in Lake Hawea and nearby in Wanaka. Enjoyed the peace and serenity. Thanks for the use of mountain bikes, we all enjoyed the bike tracks. Cardrona close by for skiing. We hope to come back again. Special amenities: Lots of sports gear for families and children to enjoy together incl. Adult Kayaks + lifejackets, Bikes + helmets, Golf Clubs, Board games, books, toys, tennis gear, cricket gear, DVD library and wonderful outdoor spaces to explore. Winter Activities Skiing- Ski fields from house 40mins drive to Treble Cone, 30mins to Cardrona (family field), Snow Park (half-pipes) & Snow farm Summer Activities Day walks, hiking, mountain biking, boating, water-skiing, fishing. Recommended Day Walks: Mt Iron, Diamond Lake, Matukituki Valley, Rob Roy Glacier and Mt Aspiring National Park. Family Activities: Toy and Transport Museums, situated at Wanaka Airport. The famous Puzzle World, Cinema paradiso. FREE to use Adult Kayaks + Lifejackets and Bikes + Helmets, FREE WIFI Umlimited Internet, SKY TV Sports, Outdoor BBQ, DVD's, Board-games. Master bedroom has ensuite - with toilet and shower plus showerdome. Main bathroom has bath , shower with a showerdome and separate toilet. Tea, coffee and sugar provided, plus spices and other condiments. Kayaks and lifejackets are available to use free. Cardrona and treble cone are located 30min drive from house. Tennis rackets available and the tennis courts are located 100m up the road. A place with a great view. We enjoyed the location of this property. The views are to die for. Thanks. Clean, warm,comfortable house. Everything we needed was there. Great lake views. Lovely location. Awesome place, the view is to die for. Awesome place, the view is to die for. There is everything you need. Plenty of linen, dinnerware, glasses etc. Board Games, Bikes & Kayaks. Could just take away a few things to make it less cluttered. Close to hotel & shop. Very peaceful. Too much clutter and unnecessary items in the house. This was our2nd stay at Bellevue and we will be back again. This was our2nd stay at Bellevue and we will be back again. It is a very special place, with the most breathtaking views and such a comfortable, well set up house. We have 3 teens, and it is great they can all have their own bedroom, while there is plenty of communal space to watch movies and play board games. And the local store around the corner and hotel across the road, but when in the house it feels like you are the only people in the world. AAA+++ absolutely recommend! !